In this series, we sit down with our teachers and ask them about their experiences teaching at BASIS Independent Fremont, what motivates them, and some other fun questions. 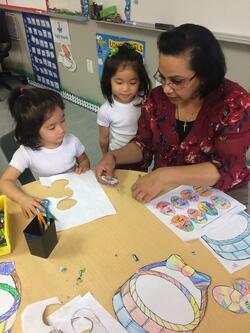 Today we talk with Ms. Jancy, one of our lead Kindergarten teachers. What do you enjoy the most about teaching at BASIS Independent Fremont? I enjoy the freedom to exercise my teaching skills and philosophy. I also appreciate and greatly value the support from the administration, the staff and my co-teacher. What do you hope students take away from your classes? I hope that my students cultivate a life-long love towards learning and exploring. Can you think of a memorable anecdote from teaching at BASIS Independent Fremont? When the youngest student in my class started reading sentences, I was so overjoyed, that I jumped up and down in excitement and had tears of joy. I knew that I have ignited the spark of learning in her. What do you enjoy doing outside of teaching? I enjoy enhancing my culinary skills by experimenting with the food and flavors of different countries and cultures. Can you share some of your accomplishments or awards? I was awarded the first place in the school science fair for three consecutive years (2012, 2013, 2014). What motivated you to become a teacher? I have always wanted to leave behind a generation of great leaders, thinkers, and compassionate human beings. I knew that one way for me to achieve this goal was to become a teacher. That means I would have the role and the responsibility to feel empowered. I knew that with my passion and skill I could spark the fire of life-long learning within every child and help them become kind and responsible adults. What are some of your favorite all-time books? All Laura Ingalls book series! Is there someone who you consider to be an inspiration? If so, who are they and why are they an inspiration to you? My children are my biggest inspirations. They motivated me to become a teacher. They continue to inspire me to become a better human being.